ASP.NET Forums/Community/Book Reviews/Any one know about asp.net for dummies. Any one know about asp.net for dummies. any one can explain me about this book who read alredy. this is help full deep knowledge. 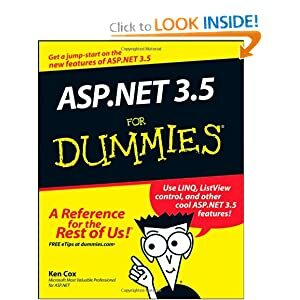 Re: Any one know about asp.net for dummies. You should rather go for other books other than dummies book in my opinion. The following links below talks what the book is all about. you know any good material printed and videos also for asp.net 70-562 exam. i want pass this exam one shot and with in one mmonth. yes i have this book,this is best. but Is this sufficient for microsoft exam 70-562 ?